Houmous is one of our favourite Turkish food ingredients as it is delicious, super healthy, and really easy to make. Houmous originates from the Middle East but has become in demand all over the world. It is now a permanent fixture in many UK supermarkets with a range of options available. 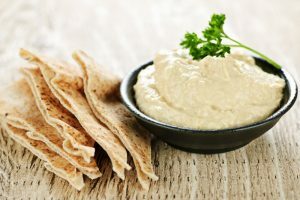 Houmous is a dip or spread which is made from a blend of chickpeas, tahini (sesame paste), garlic, lemon, and olive oil. The word ‘houmous’ comes from the Middle East and means ‘chickpea’. ‘Houmous bi tahini’ is the full name, which means ‘chickpeas with tahini’. The houmous recipe has slight variations across different countries. For example, some countries use butter whereas Turkey uses olive oil instead. The humble chickpea can make for a delicious dip when blended with the above ingredients. The first recipe that resembled houmous was found in cookbooks in Cairo in the 13th century. This means that houmous has been around for many centuries! Previous recipes have a variety of different ingredients from the houmous of today. One older recipe contains chickpeas, vinegar, herbs, spices, and lemon. Another contains chickpeas, vinegar, tahini, nuts, herbs, and spices. 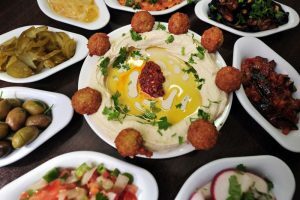 Houmous is often served in the Mediterranean as part of a meze which is a shared starter containing a range of small dishes such as falafel, souvlaki, halloumi, and olives. The most common accompaniment to houmous is pita bread. However, it is a great accompaniment for many other foods including raw carrots, peppers, toast, fish, and meat. Be adventurous and try it anything you fancy! Houmous is a super healthy food that can be very beneficial to your health. Check out the benefits of each ingredient below. 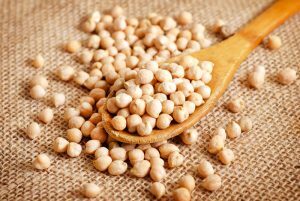 Chickpeas – high in fibre, iron, and zinc. Good for digestion and reducing inflammation. Tahini – high in calcium and iron and contains good fats. Good for healthy skin. Garlic – contains vitamin c, selenium and allicin. Can boost the immune system, lower cholesterol, and lower blood pressure. Lemon – high in vitamin c and potassium. Can help with indigestion, cold/flu relief, and constipation. Olive Oil – contains oleic acid which can reduce inflammation. As you can see each ingredient in houmous is very healthy indeed. Mixing all this together makes houmous a delicious dip that is really good for you. Next time you come into Mega Charcoal Grill why not add a side of houmous with some pita bread to your order. This is great for sharing with family and friends and means you are adding a healthy touch to your takeaway.